Last night D. and I drove from Delphi to Kastraki so that we could start our day at the Meteora early in the morning. We stayed at the Doupiani House, which was a nice and comfortable hotel with fantastic views of the surrounding mountains. Please don’t expect an extraordinary customer service and neither fast-speed internet, but if you’ve got a room with the view, who needs the internet?! Meteora, which means “suspended in the air” is a UNESCO World Heritage site and the second largest and most important Greek Orthodox monastery complex in Greece, after Mount Athos. 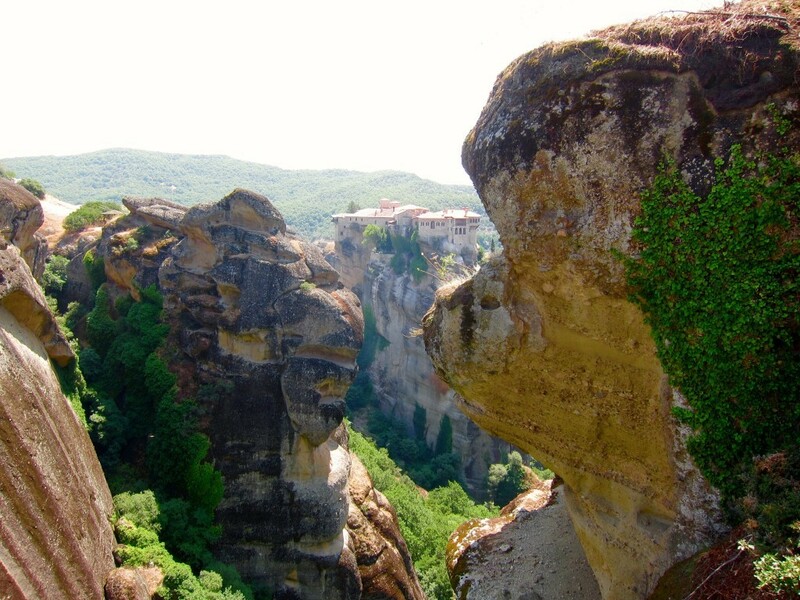 The mountains of Meteora became the place of refuge in the 9th century, when hermits and holy people began to occupy the fissures and hollows of the rock towers. However, the full monasteries weren’t established till about 11-12th century when hermit monks started living among the caves and cutouts in the rocks, high on the top of the cliffs. In the 14th century, Meteora’s inaccessibility became an advantage for the Christian monks escaping the Turkish occupation after the fall of the Byzantine Empire. At that time, about 20 monasteries existed, perched on the top of the rock pillars like eagle nests, only 6 of them survived to present time (4 for men and 2 for women) with less than 10 monks living in each monastery. The earlier monasteries were reached only by climbing the removable ladders or nets, which were replaced “only when the Lord lets them break”. However, in the 1920s, steps were hewn into the rock, which made the monasteries accessible via path-walks or bridges. 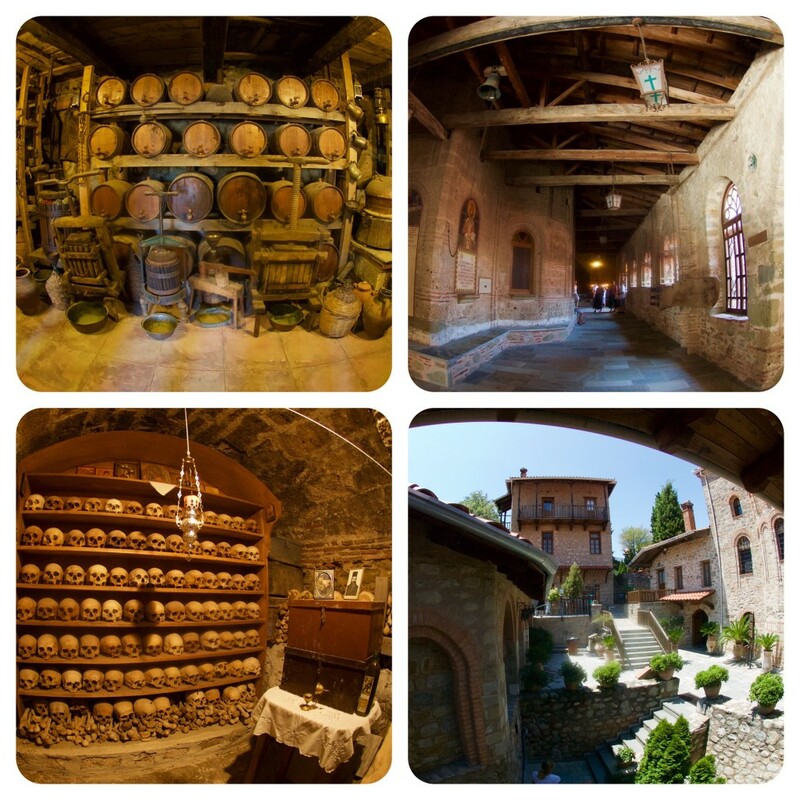 Since the 1960s till present time, Meteora is undergoing the remarkable renovation and building activities. 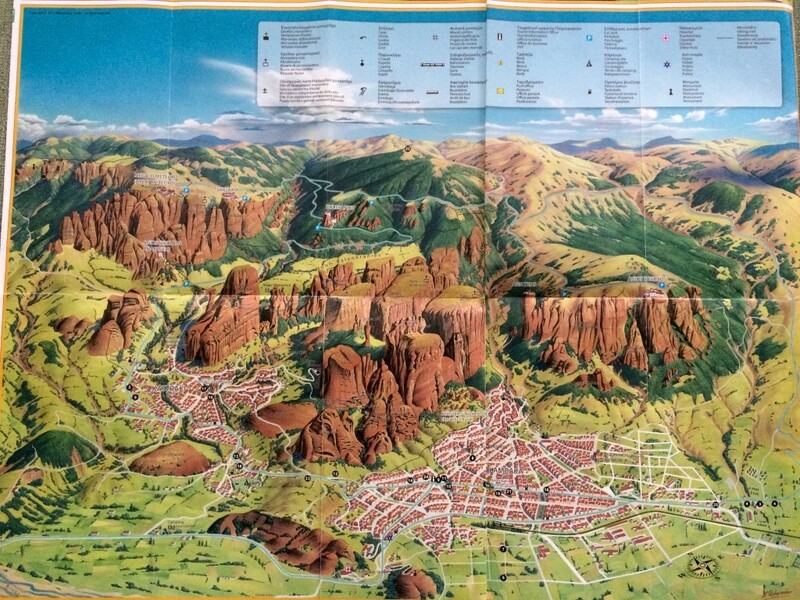 I guess it facilitated the influx of tourists to Meteora who, despite the “beach season” were virtually everywhere. The Holy Meteora Monasteries constitute a crossroads of faith, civilization and history, where God’s creation with human intervention, the magnificence of the natural scenery with the grandeur of architecture, the monastic expression with the history and culture, the self-denial and heroism with the national self-consciousness and sacrificial offering were united together in an excellent and unprecedented way. It is also, perhaps, one of the most esthetically beautiful places you would ever lay your eyes on; sadly, my camera wasn’t able to capture it, but my memory was! 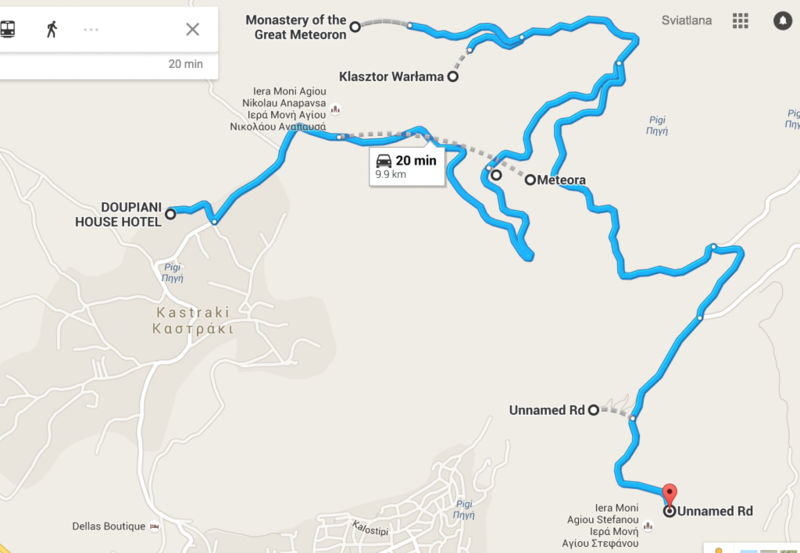 You can take public transportation, hike via “monk paths” or drive the main sealed road surrounding the entire Meteora complex. We drove because it was the only way we could see all 6 monasteries in one day. Note, the opening hour is 9.00, but closing hours vary, from 16.00 till 17.45. The best days to visit are Saturday and Sunday, when all monasteries are open. Entrance fee is €3 per monastery. Most monasteries don’t allow photos inside and please, dress properly – no shorts or short sleeves for men; no pants, shorts or short sleeves for women. For additional book recommendations, please click here. We started at 8.45 am and drove to the Moni Agiou Nikolaou, then to Agias Varvaras Rousanou, then to Moni Varlaam, to Megalou Meteorou, then to Agias Triados and finally to Agiou Stefanou. And even though it is very compact, the climbing and the sightseeing took most of the day. Important to mention that my fitbit logged 108 flights of steps by the end of the day. The Monastery of St. Nicholaos Anapafsas (9.00-16.00, closed on Fridays; pictures aren’t allowed inside) is situated just outside Kastraki village, it is the first monastery we met on our way to Meteora. All around it, we could see the ruins of other monasteries of Prodromos, Agia Moni and Pantokrator, as well as a small church of the Virgin Mary. The rock, where the monastery stands, is very small and narrow at the top. This influenced the whole architecture of the monastery, since it couldn’t grow wider, but only taller. Going up the first staircase, we saw the small chapel of St. Antony and the crypt where, in the past, were kept the codices and heirlooms of the monastery. The chapel is of great importance, because on its walls there are paintings dating to the 14th century which, consequently, was the date of the monastery’s construction. On the next floor, near a long corridor, stands the Katholikon of the monastery, the church of St. Nicholaos and on the last floor the old refectory decorated with paintings. Today, the renovated refectory is used as a grand reception room. On the same floor there is also the ossuary and a renovated in 1971 chapel of St. John the Baptist. The origin of the name of the Monastery of St. Nicholaos Anapafsas is not ascertained yet. It probably bears the name of one of its early founders at the beginning of the monastic life on this rock in the 14th century. Others connect the origin of the name Anapafsas with the verb “anapavomai” which means “I rest” and this way Anapafsas means a place for spiritual rest and refreshment. In any case, the official letter of the year 1392-1393, which is kept in the archive of the Great Meteoron Monastery, has a mentioning of the little chapel of St. Nicholaos which was likely the present monastery. The monastery was fully renovated during the first decade of the 16th century, when the present Katholikon was erected. It is a small almost square church, uneven and irregular due to the narrowness of the rock it is built on. It has a small cupola at the center of the roof which is dark without any windows, since another storey had to be built right above. In October 1527, according to the building inscription over the entrance of the narthex, the elegant Katholikon was painted by the famous Cretan painter Theophanis Strelitzas, the so-called Bathas. It is his oldest known work and it depicts representations of full-bodied saints, enthroned Virgin Mary, miracles performed by Jesus Christ, the imposing, multi-figured depictions of the Second Coming, along with the representation of Adam in the garden of Eden where he names the birds and animals:”And Adam gave names to all the aminals and all the birds of the sky and every beast of the fields” (Gen 2.20) etc. The Monastery was abandoned and started to fall into ruins in the first decade of the 20th century. It had already been deserted when N. Veis visited it in December 1909 for the registration of the manuscripts. In the 1960s, the buildings along with precious paintings were restored under the direction of the Archeological office and currently, it is an inhabited, fully functioning monastery, whose wall-paintings are world’s best examples of the Byzantine art of Theophanis and the iconographical tradition of Orthodoxy. 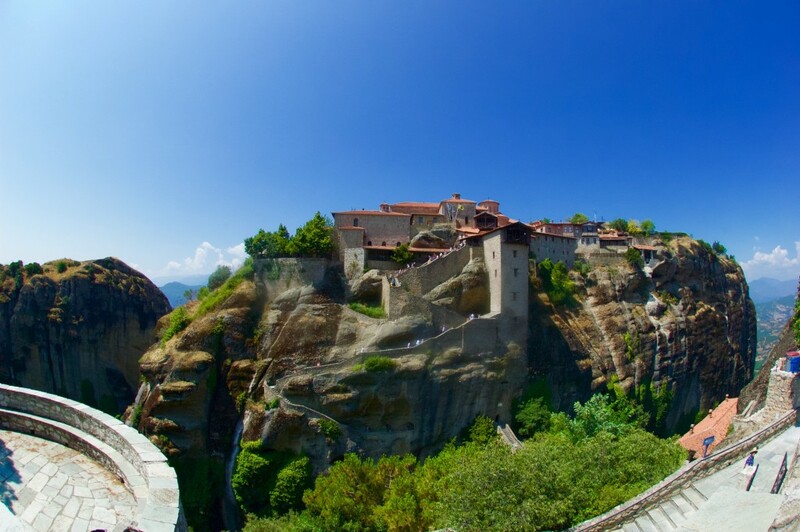 It also has spectacular views of Meteora from the platform on the roof. The second monastery we drove to was the Monastery of Varvaras Rousanou (9.00-17.45, no photos or videos allowed. Closed on Wednesdays). It is built on the most striking pinnacle and its complex of buildings covers the whole plateau of the steep rock in such a way that looks like a natural continuation of the rock. 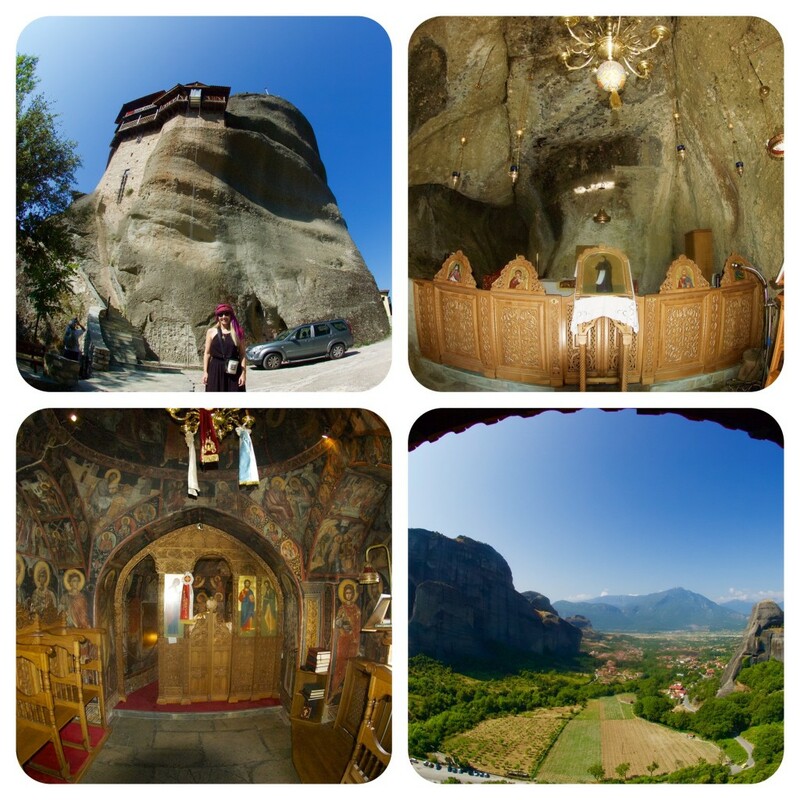 It is easily one of the best places to enjoy all the beauty and magnificence of the unique Meteora landscape, and even though I am not very religious, I could see why the faithful Christians would feel a spiritual uplift here. On the east, we could see the Holy Trinity and St. Stephen’s monasteries and on the west, the Varlaam Monastery and the Great Meteoron further away. All around the rocky forest of the innumerable gigantic crags stretches away and deep in the horizon, the mountain massifs of Koziakas and Pindos, captured our eye. For the ascending to the Monastery a rope-ladder was used but today it can easily be done by cement steps and two small solid bridges constructed in 1930. Already in 1868, during the abbacy of Gideon, a wooden bridge has been constructed replacing the dangerous ropes on account of easier and safer access to the rock. In the beginning of the 20th century, the Monastery was almost abandoned and deserted. For around 20 years, till 1971, only one old pious woman Efsevia from Kastraki lived there. Since 1982, after its basic renovation and restoration, the monastery began functioning as a nunnery and today the sisterhood of 15 nuns continues the renovation of this small and beautiful monastery. There are many explanations of the origin of the name, however, none of them is verified. Likely, Rousanou Monastery took name of the founder of the original church in the 14-15th century. 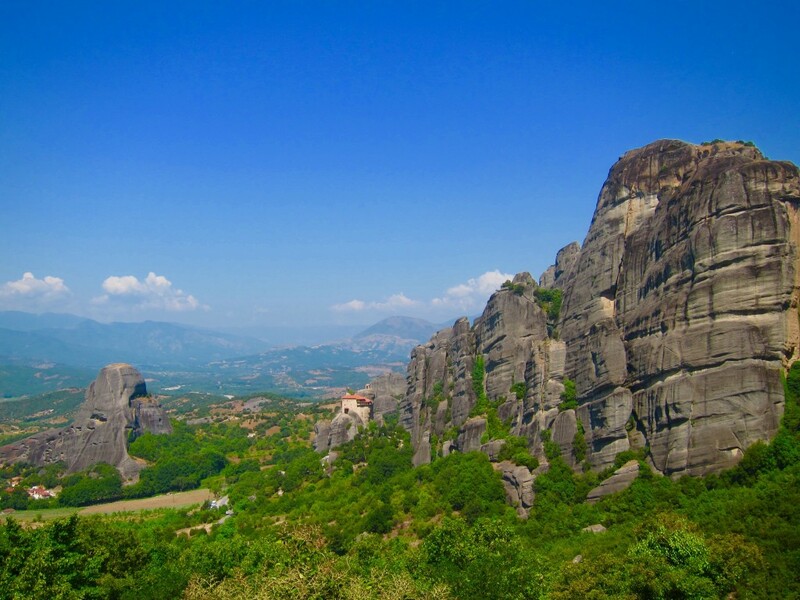 In addition, there are records in the “History of Meteora” of 1882, that the rock of Rousanou was originally inhabited in 1388 by a priest-monk Nikodemos and his fellow hermit Venediktos. The only official document about the erection of the Monastery of Rousanou and its history in general is the testament of two brothers-priests from Ioannina – Ioasaph and Maximos. Following the example of their compatriots, monks Nectarios and Theophanis Apsaras, who already been settled in the rocky town of Stagoi in 1510, they asked the permission to lead a secluded life on one of the rocks in Meteora and were given the rock of Rousanou, somewhere between 1527 and 1529. Once the brothers settled on the rock, they began a remarkable construction. They rebuilt from its foundations the ruined and destroyed by the ravages of time and desertion old Katholikon of the monastery (14-15th century), the church of Transfiguration of the Savior, and they gave it its present form. They also built cells and other service rooms; they supplied the monastery with consecrated vestments, holy vessels, manuscripts and other ecclesiastical heirlooms. All the monks of the monastery were obliged to keep unswervingly the equality, the common ownership and the lack of property; special or preferential treatment was prohibited. The Katholikon has the characteristic style of Mout Athos like most of the monasteries in Meteora. The main church is two-columned, cruciform with a cupola in the center and two lateral niches on the right and left, the choirs. The cupola is polygonic with mono-lobed windows and predominates the whole elegant monastic complex due to its imposing height. The sanctuary is built towards the north, due to the shape of the rock. The church is dedicated to the Transfigurations of the Savior, however, in this monastery the memory of St. Barbara is particularly honored and venerably celebrated on the 4th of December. The decoration of Katholikon was made in 1560, almost 30 years after the erection of the monastery. We don’t know the name of the painter, but the remarkable wall-paintings are an exceptional example of the post-byzantine art (pay attention to Resurrection and Transfiguration paintings). In the middle of the 16th century, a bibliographical workshop probably functioned at the monastery with the well-known scribe the priest-monk Parthenios (1565). At times, this monastery served as a refuge and shelter for many people and families. According to records, in 1757 a lot of people from Trikala persecuted by the Turkish pasha found refuge here; also, in 1897, after another war with Turks, many families from Kastraki and Kalambaka were sheltered under the roof of the Monastery of Rousanou. 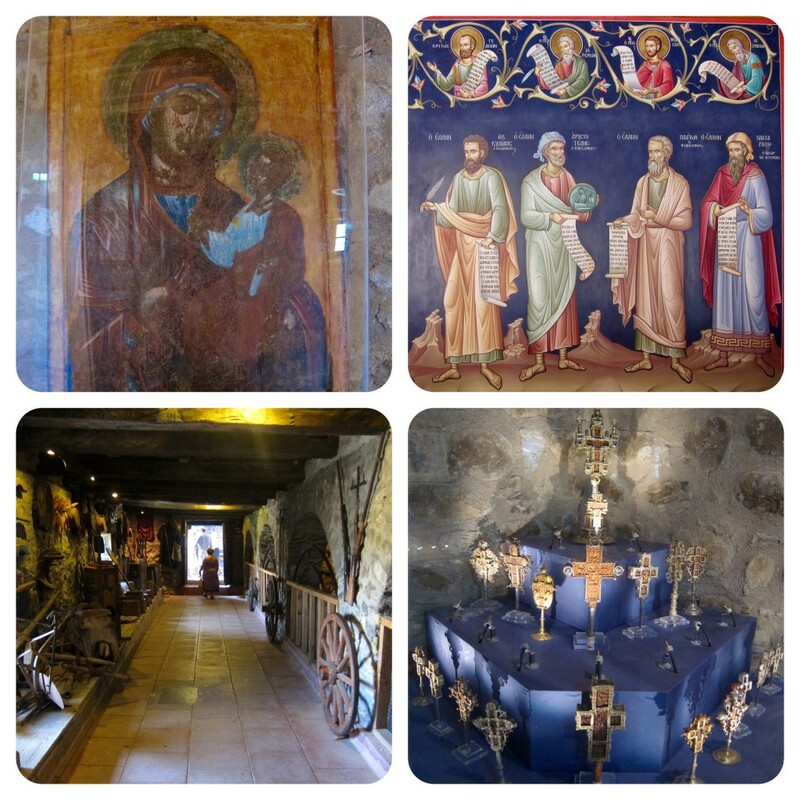 Our third stop was at the Monastery of Varlaam (9.00-16.00. Closed on Fridays. No photo or video allowed in the church or the museum). According to the tradition, the first inhabitant settled here about 600 years ago in 1350, his name was Varlaam and he was a contemporary of Saint Athanasios. The present magnificent Katholikon that is honored in memory of All Saints was erected in 1541-1542 by two brothers priests-monks from Ioannina – Theophanis and Nectarios Apsaras. However, the rest of the work in the church and the narthex continued until May 1544. According to the historical record, Theophanis, during his last days summoned up all his energy and went out of his cell to see the newly constructed church. Fascinated by it beauty and glamour, he glorified God and All Saints to whom he had devoted the church. Then he blessed all the monks who had worked in the monastery as quarrymen, builders, woodcarvers, for the completion and the illustration of the church and finally deeply satisfied and stirred, he returned to his cell where he died in peace. The Katholikon of the Monastery has typical, elegant, Athonite style and its main church is two-columned, cruciform, inscribed with the two typical niches of Mount Athos. The nave was decorated in 1548 and even though the name of the painter isn’t know, it is concluded to be that of the Theban painter Frangos Katelanos. On the cupola, there is a representation of Pantokrator (All-Mighty) as a Fair Judge, in the tympanum where is the honorary chorus of the prophets and angels, on the pendentives the four Evangelists, of whom Luke is depicted to paint an icon of the Virgin Mary. On the west wall above the entrance is the established representation of the Dormition of the Virgin Mary, the center of which is predominated by her lifeless body on the death bed, while Lord is gently holding her pure soul flanked by angles and apostles. On the east columns of the sides of the iconostasis, a full-bodied Virgin Mary and Jesus Christ are depicted richly decorated and with crowns over their heads. Below the Virgin Mary, there is Theophanis and below the Christ, Nectarios, the two founders of the monastery in monastic frocks looking humble and venerable, offering an exquisite model of their church. According to the inscription on the wall, in 1780-1782, all the paintings of the sanctuary of the Katholikon and the narthex were restored with the help and at the expense of Parthenios. He was a well-known scholar and energetic bishop, who has been a monk of this monastery and a great donor. Among others, he donated to the monastery his remarkable personal archive and all his library. Today the Varlaam Monastery has a rich and admirable collection of 290 manuscripts. In 1857, the narthex was renovated once more and finally replaced by the present outer-narthex with the guests’ quarters on the upper floor. A portable icon of particular artistic value is Theotokos Vrefokratousa (Virgin Mary holding the child in her arms) surrounded by two angels and many saints made in 1668, by the famous Cretan painter Emmanuel Tzane. Of great importance, besides its artistic value, is the gold embroidered Epitaphios on green velvet tissue, a work of 1609 which proves that the monastery had a specialized workshop of gold embroidery. On the northwest edge of the rock is situated the single nave chapel of the Three Hierarchs, which, according to its inscription, was built in 1627 and decorated in 1637 by Ioannis the priest from Kalambaka and his children. The paintings are very well preserved and they constitute a characteristic artistic complex of the first half of the 17th century. Very interesting is the presentation of the 24 “Oikoi” of the Virgin Mary and very impressive, on the west wall are two multi-figured compositions, on the right the Dormition of St. John Chrysostom and on the left the Dormition of St. Ephraim from Syria. The modern chapel replaced the old humble one which had originally been built by the first inhabitant of the rock. In the monastery of Varlaam, other remarkable buildings are: the Old Refectory (dining room), that has been renovated in 2000, painted and restored to its initial use; the Hestia or kitchen, one of the most elegant buildings with a vaulted roof and a perfect eight-sided cupola as a chimney; and the hospital. Another significant building is the Sanctuary, which was built in 1998. Inside, there are exhibited the heirlooms of the monastery. Next to the sanctuary, there is a small chapel of Sts. Anargyroi (Unmercenaries). The fourth monastery we visited, was the oldest, largest and the most formal of them all – The Holy Monastery of the Great Meteoron (Transfiguration) (9.00-17.00, closed on Tuesdays). Perched on the most imposing rock, 613 m above sea level, it occupies a commanding position among the monastic complex of Meteora. The Meteoron was founded shortly before the middle of the 14th century by Saint Athanasios the Meteorite, who was also the first to organize a systematic monastic community. St. Athanasios, the son of eminent parents was born at Hypati, the well-known medieval town of Nea Patra, in 1302 and was christened Andronikos. After an untimely death of his both parents and the capture of his home town by the Catalans in 1318, his uncle and he went to Mount Athos but he wasn’t allowed to stay there due to his young age. Restless and dynamic Andronikos set forth on new wanderings and adventures which eventually brought him to Constantinople where he made the acquaintance of erudite ecclesiastical men of letter such as Gregory Sinaitis (the future Ecumenical Patriarch Isidoros) and Daniel Hesychast. With their help he was initiated into the secrets of the hesychastic life and soon, after a trip to Crete, he returned to Mount Athos in 1332. At Milea on the Holy Mountain he was accepted as a novice by two virtuous anchorites – Gregory and Moses – taking a new and permanent monastic name Athanasios. However, the incursions of the Turks forced Athanasios to leave Mount Athos and together with his spiritual father Gregory, to settle in the Thessalian rocks of Stagoi. Seeking more seclusion and with a permission from Gregory, Athanasios withdrew to the cave where he prayed in solitude and spent his free time weaving baskets so that he would never be idle and thus safe from the danger of falling into temptation. Later on, he selected another rock “a place for anchorites, a rock which rose high into the skies” where he permanently settled in around 1340. 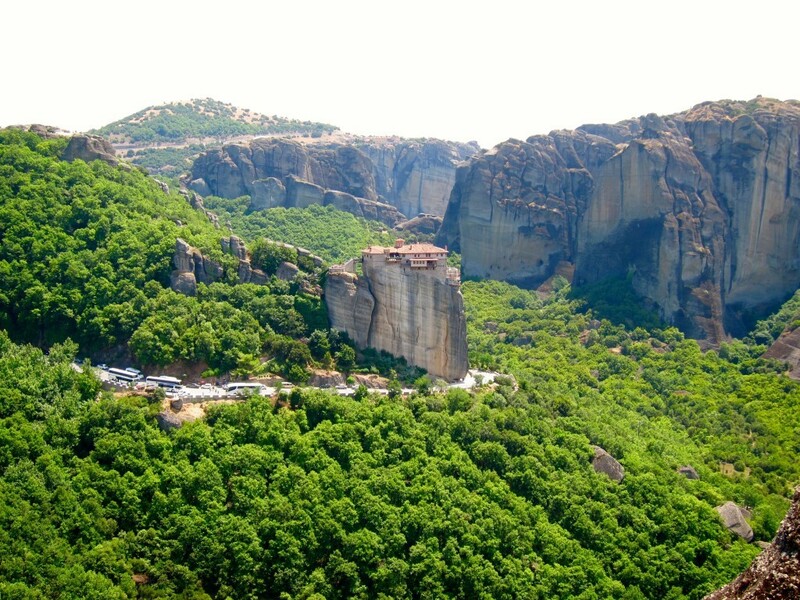 The rock was called Platylithos (Wide Rock) but Athanasios called it Meteoron, a name that was going to be preserved through the centuries and be applied in general to the whole complex of the surrounding monasteries and crags and become known far beyond the borders of Greece. On that rock, Athanasios built his ascetic refuge and organized the first systematic monastic community which had strict coenobiotic religious rules. The brotherhood had 14 members who initially built the church of the Theometor (Mother of God, the Virgin on the Rock of Meteoron) to whom Athanasios also dedicated the monastery. Later, he built another church in honor of the Transfiguration of Christ, which finally became the Katholikon of the monastery and gave the monastery its present name. Nowadays, as you climb up the rock-hewn stairways to the monastery, on the left, just before the entrance, you can see the hermitage of St. Athanasios within the natural crevice in the rock arranged as a humble and basic dwelling with the essential tiny chapel. Here, the ascetic hermit first lived alone after he scaled the “Wide Rock” and before he built a church and cells for the monks. Extremely humble, as Athanasios had been all his life, he remained an ordinary monk. Perhaps due to his extreme humility he didn’t leave any written texts although he was very knowledgeable and well-educated. According to his biographer, he died peacefully after a brief illness of the gallbladder at the age of 78 in 1380. His successor and the second founder of the Monastery was the ascetic monk Ioasaph, the former king Ioannis Uresis (Uros) Angelos Komninos Palaeologos. Born in 1349-1350 as a son of the Greek-Serbian king of Thessaly, since the early age he rejected the temporal power and the din of the world and exchanged the royal purple for a monk’s habit. 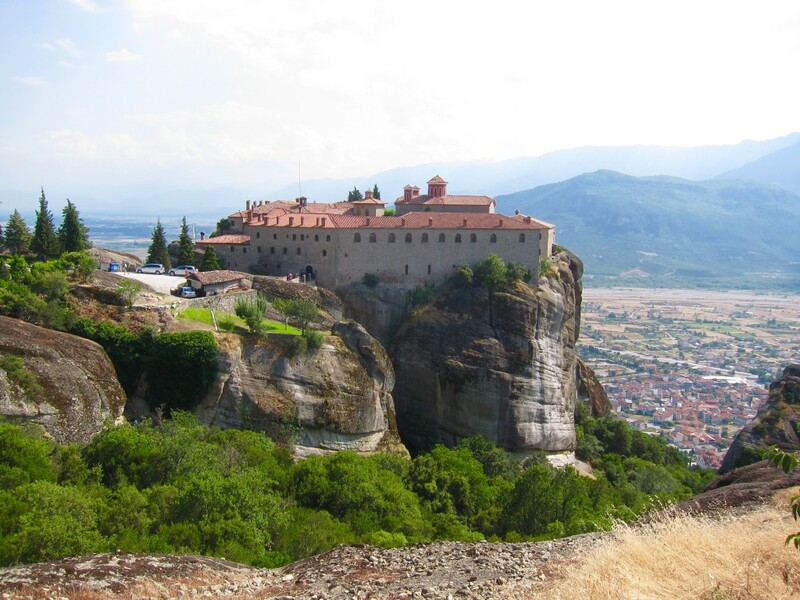 With his arrival, the monastery acquired all his wealth, becoming the richest and most powerful in Meteora. According to official inscriptions of the monastery, in 1387-1388, Ioasaph enlarged and rebuilt the original church erected by Athanasios, transforming it into a magnificent edifice. This is the church-shaped sanctuary of the present Katholikon of the monastery which is embellished with exquisite wall-paintings from 1483. In 1389 Ioasaph contributed to the foundation and promotion of Hypsiloreta Monastery, the so-called “of the Calligraphers” on the inaccessible steep rock opposite to the Great Meteoron. During the second decade of the 16th century, when Neagoe Basarab was Voevode (ruler) of Vlachia (1512-1521), this dynamic and pious prince constructed at his own expense a tower and an ascension ladder for the monastery. The monastery flourished in the middle of the 16th century, benefiting from all the privileges and absolute autonomy. The magnificent nave and the lite of the present impressive Katholikon was erected in 1544. Architecturally the church is of the Athonite type, cruciform, four-columned with two lateral niches to the left and right. In 1557 energetic Abbot Symeon built the refectory, an interesting and important structure divided into two aisles by 5 columns down its length and with technically remarkable brick-built arches, cross-vaults and barrel vaults on the roof. On account of all these activities the Epirote Abbot is considered as the third founder of the monastery. In July 1572, according to a clay inscription, the monastery infirmary and geriatric facility was built. It is a noteworthy architectural structure with an elegant brick-built ceiling on the ground floor, the central vault of which rests on four columns and has eight lateral cross-vaults. Among the former Abbots who left their indelible marks on the monastery, an outstanding figure is Pathenios Orphides the “most musical” and “cantor” in the late of the 18th – beginning of the 19th century. He is repeatedly mentioned in inscriptions as renovator and donor of icons in the chapel of St. John the Baptist (1784), in the iconostasis of the Katholikon of the monastery (1790) and in the chapel of Sts. Constantine and Helen, which was erected in his days (1789). Finally on his initiative and at his own expense a new wing of cells was built. In 1809, the Abbot Parthenios Orphides was incarcerated in the Pasha’s dungeon because the Great Meteoron Monastery, like all the other monasteries, had encouraged and supported the patriotic movement. For this reason many monasteries in Meteora suffered (or have been totally erased) from the vengeful wrath of the heinous tyrant of Ioannina. The monastery has two old chapels. The chapel of St. John the Baptist with vaulted interior and saddled roof, nowadays has the form of a small single aisled church of the end of the 18th century indicative of other functions, possibly dating back to the days of the holy founders Athanasios and Ioasaph. It was probably arranged as a chapel at the beginning of the 17th century. It stands at the east edge of the southern side of the Katholikon. The chapel of Sts. Constantine and Helen is also a small single aisled church of the end of the 18th century with a lovely cupola of the Katholikon. According to the old inscription it was erected in March 1789 when Partheniios Orphides was the Abbot. It stands on the west of the Katholikon. In the monastery there are also two new chapels. The one is dedicated to Saint Nectarios, it is located on the ground floor of the renovated north-west wing of the cells and it is decorated with new artful wall paintings. The second chapel is located at the south-west of the Katholikon, it is dedicated to Saint John, the writer of the “Klimax” and to Saint equal-to-the-Apostles Olga, the Russian Queen, and it is used as a church for the reposed. Lots of catastrophes hit the Great Meteoron Monastery throughout the centuries such as “incursions of the impious and ungodly (Turks) who stole, looted and set on fire in the year 1609”. In 1616 on Good Friday, the Monastery was cruelly looted and four monks were killed by the Pasha of Ioannina Arslan-Bei. Yet, the Great Meteoron, through endless adventures and persecutions during the last six centuries, continued uninterruptedly its monastic presence and radiance and kept an important part of its treasures and priceless national and religious heirlooms. For all this time, the monastery remain a true bastion of the Orthodox believes and traditions. 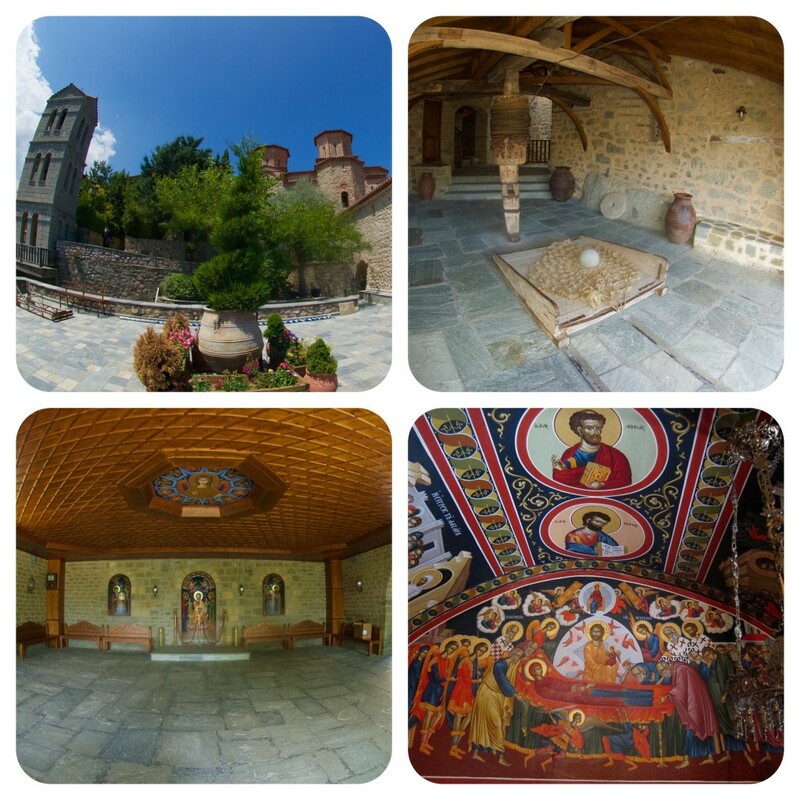 The Great Meteoron Monastery is decorated with the greatest wall paintings and frescoes in Katholikon (pay attention to the Martyrdom of Saints) as well as portable icons (including two donated by Maria Palaeologina in the 14th century). It owns a collection of 640 manuscripts dating from the 9th – 19th centuries, documents of Byzantine and post-Byzantine periods as well as editions. The wood-carved iconostasis on their own are masterpieces of art and along with other wooden decorations require special attention. Gold embroidery and silver objects are also very well represented in the Monastery and its several museums. 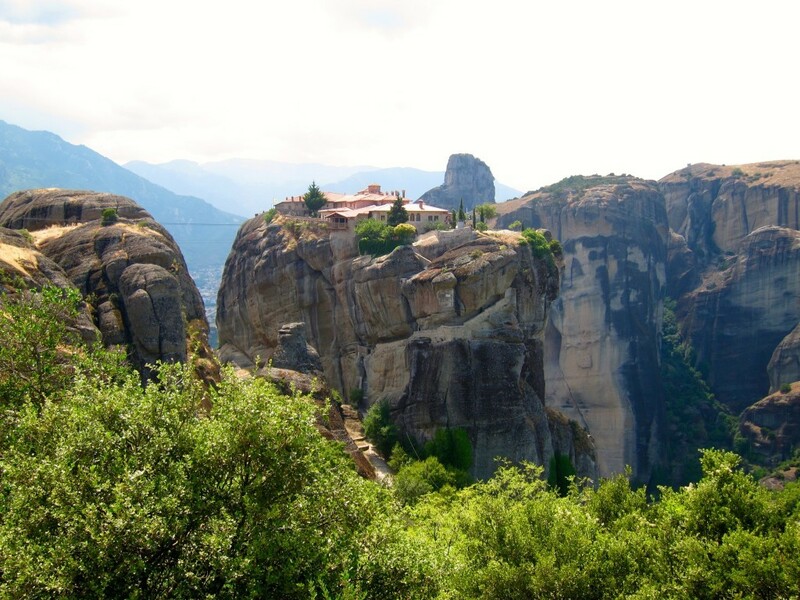 Of all the monasteries in Meteora, The Monastery of the Holy Trinity (9.00-17.00, closed on Thursdays) has the most remote feel and the longest approach. 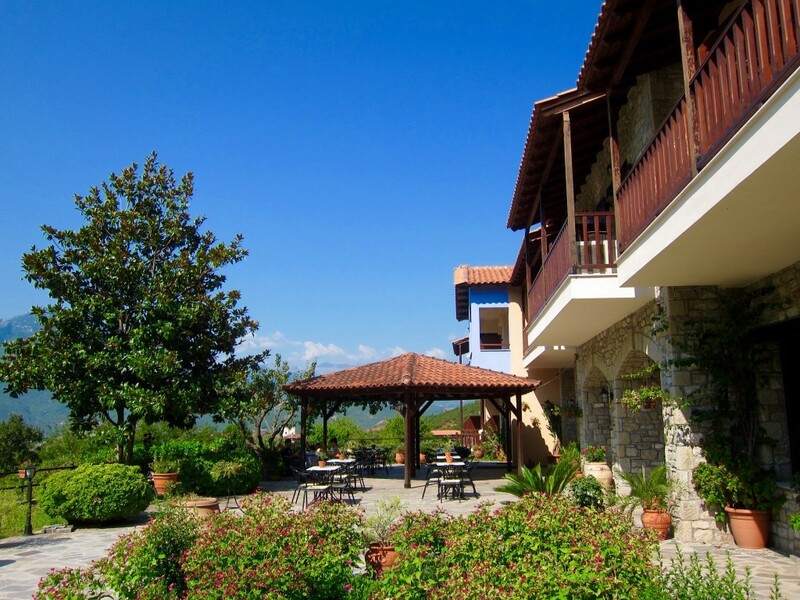 However, it is well compensated by the magnificent views – on the south, at the feet of the rock is lying the town of Kalambaka with the river Peneios flowing peacefully. On the west, the Monastery of Varlaam is discerned and a little further, the Monastery of the Great Meteoron. On the east, very near, there is the Monastery of St. Stephen. In the past a rope ladder and the traditional net were used for the ascend on the rock. In 1925 during the bishopric of the Metropolitan Polycarpos and the abbacy of Nikanor Stathopoulos a chiseled staircase with 140 steps was constructed, which is the one the tourists use today. According to the tradition, the monastery was originally built in 1438 by monk Dometios, however, the decree of Symeon Uresis Palaeologos of 1362 already mentioned “Meteoron and Holy Trinity” hence, the monastery had existed already then. The present main church represents the original construction stage of the monastery and it is the most interesting of all buildings. It seems to be erected in 1475-1476 and represents a small two-columned cruciform church with a central cupola on its roof. The east side of the church, where is the three-sided sanctuary apse with a bilobed window has cloisonne masonry and rich ceramic decoration such as serrated fascias and other ornaments. On the lateral niches the masonry is simple. There is only one window on each side, so the nave is relatively dark. The cupola is polygonic with mono-lobed windows, plinth colonnettes and serrated fascias. The present painting of the church is work of priest Antonios and his brother Nicholaos in 1741. Although, it is relatively recent, they continued the tradition of the fine post-Byzantine art. On the cupola Pantoktatos is represented and on the pendentives the four Evangelists one of whom, Luke, is represented to paint the icon of the Virgin Mary, as on the cupola of the Varlaam Monastery. Sadly, the old wood-carved iconostasis and many icons were stolen in 1979 and were replaced with the modern ones. The ample vaulted esonarthex is a later addition to the nave. It was built in 1689 and decorated in 1692. In 1684 a small sacristy was added next to the sanctuary. The building complex of the monastery also includes a refectory, cells, reception rooms, tanks and other service rooms. Very interesting is the chapel of St. John the Baptist located right after the entrance to the monastery, on the left side along the corridor. It is a small circular church with a cupola, hewn on the rock and very well illustrated. It was built and painted in 1682, however, possibly it originally served as the hermitage of an ascetic. Presently 124 manuscripts belong to the Monastery. A personal library of the scholar Paisios Klinovitis was donated to the monastery, however it was lost during the last war along with other precious heirlooms and holy vessels of the Monastery. And at the very end of the road, 1.5 km beyond the Monastery of Trinity, we finally reached our last stop – The Monastery of St. Stephen (9.00-13.30 and 15.30-17.30, closed on Mondays). 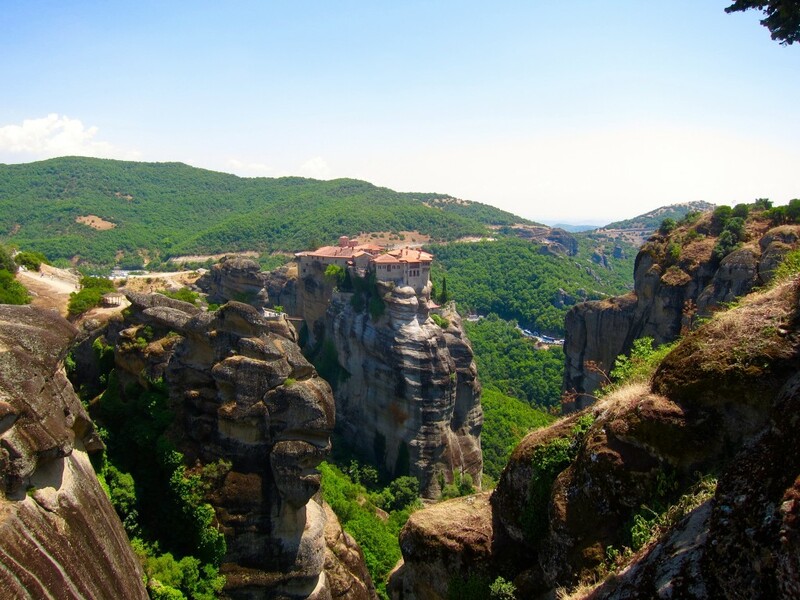 Situated right above Kalambaka, this is the only monastery that doesn’t require climbing steps as it is conveniently accessibly from the road by a small bridge. 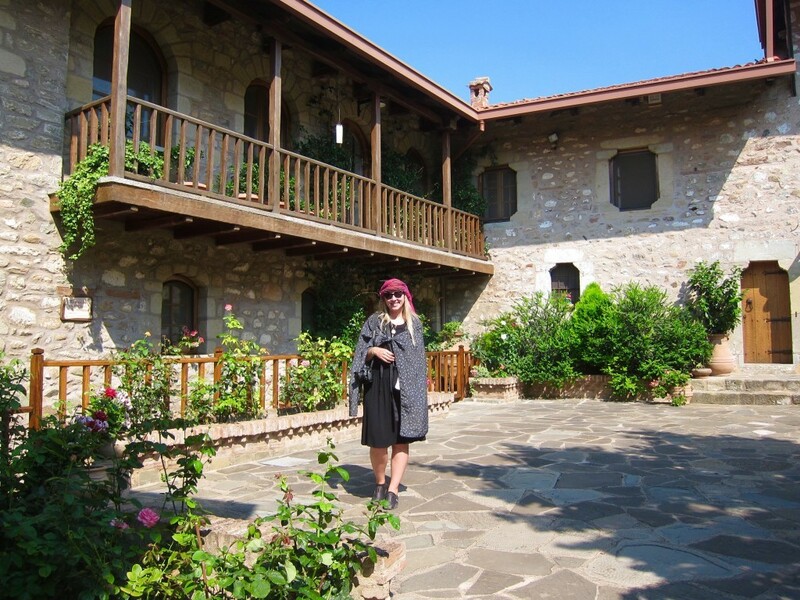 Since 1961 this monastery was a nunnery (one of two in Meteora) with a large and active sisterhood, who along with the rich spiritual and charitable work, produced a remarkable renovating and building achievements, as well as the entrepreneurial acumen. Old tradition connects this monastery with female monasticism – the Swedish traveler Jonah Bjornstahl, who visited St. Stephen’s in 1779 noted the rumors that “at the beginning this monastery was for women who loved quietism but later became abandoned until it was re-inhabited by monks”. The history of the early years of the monastery is lost in the past, covered by the mist of legends and traditions. The only proved evidence is the inscription carved on the rock near the outer entrance of the monastery, which was noticed and mentioned by old travelers in the beginning of last century. It is now lost but those who read it, said that it bore year 1191 and a name of “Jeremiah”. Two are for sure the founders of the monastery: first the Archimandrite Saint Antony – around 1st half of the 15th century, whom a later tradition connects with the glorious Byzantine family of Kantakouzenos, and the second – the priest-monk Saint Filotheos from Sthlataina, who lived around the middle of the 16th century. Shortly before 1545, Saint Filotheos renovated or rebuilt from its foundation the old small and elegant Katholikon of the monastery, the church of St. Stephen originally dated to 14th-15th centuries. He also built cells for the monks and other useful constructions, supplied monastery with ecclesiastical vessels and manuscripts and finally established the coenobitic life to the brotherhood. As of 1545, the monastery existed independently and possessed all the privileges. The small St. Stephen’s church is a single-aisled basilica with a wooden roof and an esonarthex separated from the nave by a three-arched opening, similar to the early Christian basilicas, where the nave communicated with the narthex. In or around 1545, the church was decorated (by the priest and painter Nicholaos from Kastraki) with the wall-paintings which today represent an interesting example of the meta-byzantine hagiography. In 1798 when Paisios Klenovitis was the bishop of Stagoi and when Amvrosios was the Abbot of the monastery, the present Katholikon was built in honor of St. Charalambos whose skull is kept as a holy treasure, a priceless gift from the sovereign of Vlachia Vladislav and the relative of the great vornic Dragomit. It must be noted that from the late 14th – beg. 16th century, the monastery had very tight relationships with the Romanian Royal House of Vlachia, who constructed and devoted to the monastery a chapel in Romania, and donated holy relics, vessels, sacred vestment etc. The new Katholikon imitates the architectural style of Mount Athos. The main church is inscribed, cruciform, four-columned with two lateral niches to the right and left, the choirs; an ample esonarthex-lite precedes which has four columns in the center to support the roof. Remarkable and impressive are the high and narrow cupolas, the central one (which is the largest) of the nave and two smaller of the sanctuary over the offertory and the diaconical. On the north outer side of the church wall, there is the addition of the arched porch-outer-narthex which according to inscription was built in the beginning of the 19th century. St. Charalambos Katholikon had no old wall paintings except for the Pantokrator which was destroyed in 1945 together with cupola, thus today’s sisterhood entrusted the decoration of the Katholikon to Korinthian painter-mosaic maker-iconographer Vlasios Tsotsanis who is in process of creating the paintings equally beautiful and worthy of admiration. In 1857 Abbot Constantine from Kalambaka erected the refectory of the monastery and many other buildings near the small old church of St. Stephen. Very important was his contribution to the education at those difficult times. At his own expense, the Konstantios Elementary School of Kalambaka was built which paved the way to the monasteries great tradition in educating local children and orphans. In the last years, the monastery was actively reconstructing and renovating its buildings, adding two new chapels – one is dedicated to the Holy Protection of the Virgin Mary and another is dedicated to the Archangels Michael and Gabriel and St. Claudine, the Martyr. Both chapels are adorned with wood carvings by the famous Panagiotes Kyritsis. In the monastery are kept 147 manuscripts, a lot of which are ornated with miniatures of fine artistry, elaborated headpieces and colorful decorative initials. Among the most remarkable manuscripts exposed in the museum, four folios in vellum of the 16th-17th century are very important for their paleographic value including extracts from St. Matthew’s Gospel in majuscule script. In the old refectory which is rearranged into a museum, are exposed many precious heirlooms of the monastery such as post-byzantine portable icons, gold embroidered vestments, wood carved and of silver casing crosses, elaborate silver pieces of art cincences, communion cups etc. 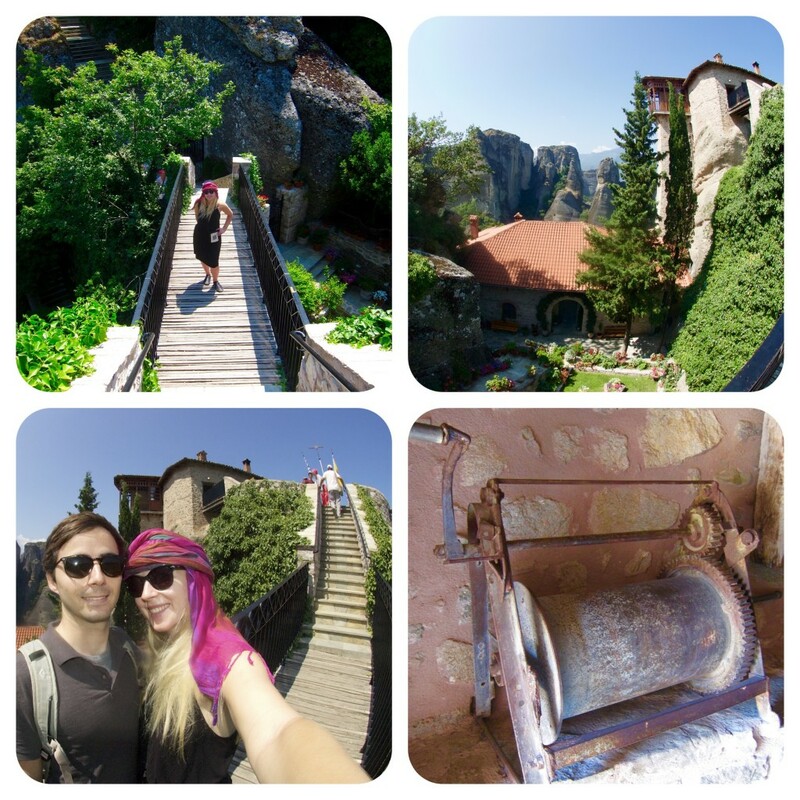 We spent over 8 hours in Meteora, visiting 6 of its surviving monasteries, admiring the incredible wall-paintings and church relics of the monastery museums, climbing over 100 flights of steps, fighting crowds and the only regret I had was not having a guide! It is a beautiful and breath-taking place, but if I were to go back again, I would definitely hire a knowledgeable person to come with us. Luckily, Meteora is one of the most popular destinations among Russian tourists, so I got to “hang out” with Russian groups and listen to their guides, which was immensely helpful. After another exhausting day, we had to drive another 1.45 hours (100 kms) to Ioannina, where we were to meet D. mom and brother with his family. It was an emotional meeting, with lots of gifts on their behalf and lots of “thanks” on mine. We spent the evening munching on delicious homemade food and drinking some local moonshine that tasted like vinegar. Oh well….. This entry was posted in Europe and tagged Abbot Symeon, Agias Triados, Agias Varvaras Rousanou, Agiou Stefanou, Arslan-Bei, Daniel Hesychast, Doupiani House, Emmanuel Tzane, fitbit, Frangos Katelanos, Frangos Kontaris, George Kontaris, Greece, Gregory Sinaitis, Ioasaph, Katholikon, Megalou Meteorou, Meteora, Meteoron, monastery complex, Monastery of St. Nicholaos Anapafsas, Monastery of Varlaam, Monastery of Varvaras Rousanou, Moni Agiou Nikolaou, Moni Varlaam, Paisios Klinovitis, Parthenios, Pathenios Orphides, Saint Athanasios, The Holy Monastery of the Great Meteoron, The Monastery of St. Stephen, The Monastery of the Holy Trinity, Theophanes the Cretan, Theophanis Strelitzas, UNESCO, UNESCO World Heritage Site, Vlasios Tsotsanis. Bookmark the permalink.